One of my favorite neighborhoods in Amsterdam is the Jordaan. 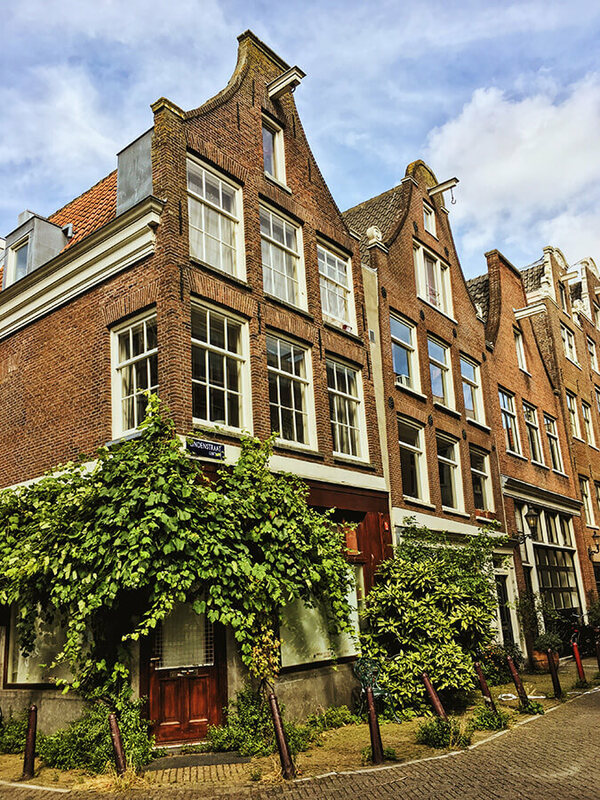 If you’re looking to escape some of the crowds of center and experience some of the charm of Amsterdam, you can follow this self-guided walking guide to the Jordaan, one of Amsterdam’s most charming neighborhoods, to see a few secrets of de Jordaan that you might not see otherwise. It’s based on my time living just five minutes away from the Jordaan. I do my best to discuss history as well as some charming cafes, restaurants, hofjes and streets that I always love to stop into. The walking tour of de Jordaan should take about 1.5 hours. The total distance covered is 2 kilometers (~1 mile), but I encourage you to slow down. Map at the bottom of the post. Warning: Not all of these locations in De Jordaan are public property, so please be considerate as well as quiet as several locations are on private property where the owners are kind enough to allow the public into daytime. When entering hofjes, please be quiet, stick to paths, and give residents their privacy. 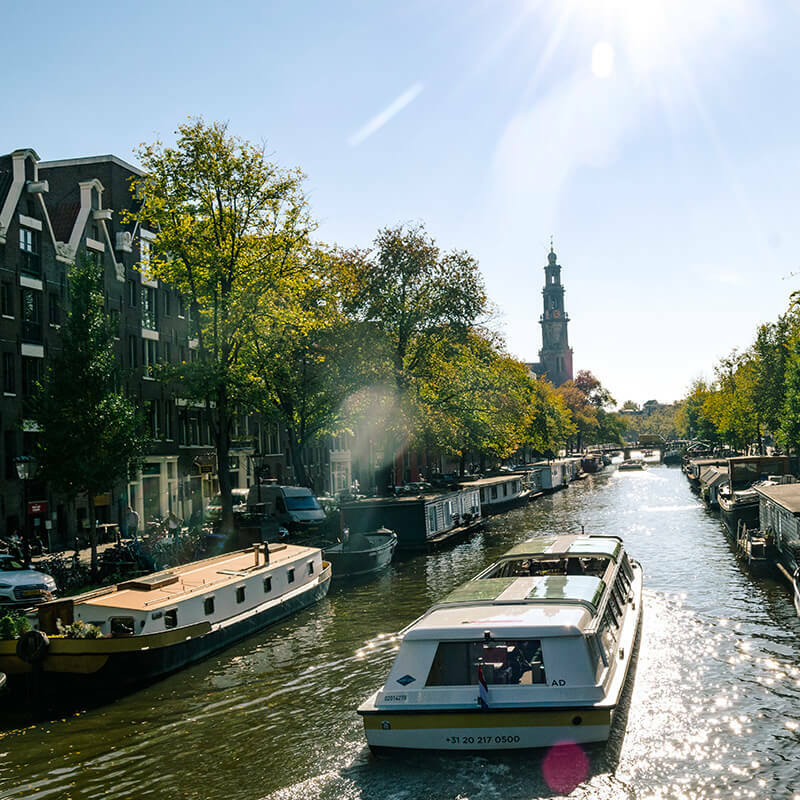 If you wish to stay in the Jordaan, you stay in a real houseboat for a unique experience. If you prefer a boutique hotel, head to Mr. Jordaan for a sustainable stay with thoughtful touches. Otherwise, you’ll find numerous bed and breakfasts within the Jordaan. One of my favorite starting points is at Cafe Papeneiland. This cafe has stood here since 1642 and it’s one of the most picturesque cafes in the Jordaan. Enjoy it from across the water first! This gorgeous typically Dutch cafe has Delft blauw tiles on the interior, a great selection of local beers from Brouwerij ‘t IJ, and friendly bartenders. Even if it’s too early for a beer, you can always enjoy a coffee. Be sure to check out the upstairs for gorgeous views over Prinsengracht. Brouwersgracht is one of my favorite canals in Amsterdam, mostly because it’s quiet. Other canals get the crowds, yet you can always walk along here enjoying the stunning scenery and the many warehouses turned residential homes. If you haven’t had breakfast yet and love something sweet, step into Sweet Bob’s for Brazilian brigadeiros. They’re pretty unique and you can get a coffee if you’re starting off this walking tour early. The name is attributed to the breweries that used to be along this canal for beer although you can still find one of Amsterdam’s last remaining distilleries along nearby Driehoekstraat: A. van Wees Distilleerderij de Ooievaar. I’d recommend walking until you reach Driehoekstraat, which is a beautiful street that seems out of place in modern Amsterdam. The many warehouses along with business brought in by the VOC (the Dutch East Indies Company) allowed the Jordaan to prosper in the Dutch Golden Age. Many workers lived in this area and a housing crisis (much like today’s housing issues in Amsterdam) forced people to keep building. The housing shortage was slightly improved through the generosity of many aristocrafts of the time who donated properties to be used as almshouses, known as hofjes, for those in need. De Jordaan neighborhood has the most number of hofjes in Amsterdam (21) although not all of these hofjes are easily accessible to the public. The Raepenhofje can be easily missed if you don’t know what you’re looking for. This historic hofje is one of the oldest almhouses in Amsterdam that was endowed by a wealthy merchant. The small hofje with only six houses is intended for widows and today it remains a quiet refuge for young woman. The door is not always open and it feels quite private inside, so peek inside the door (if it’s open) when you pass by. 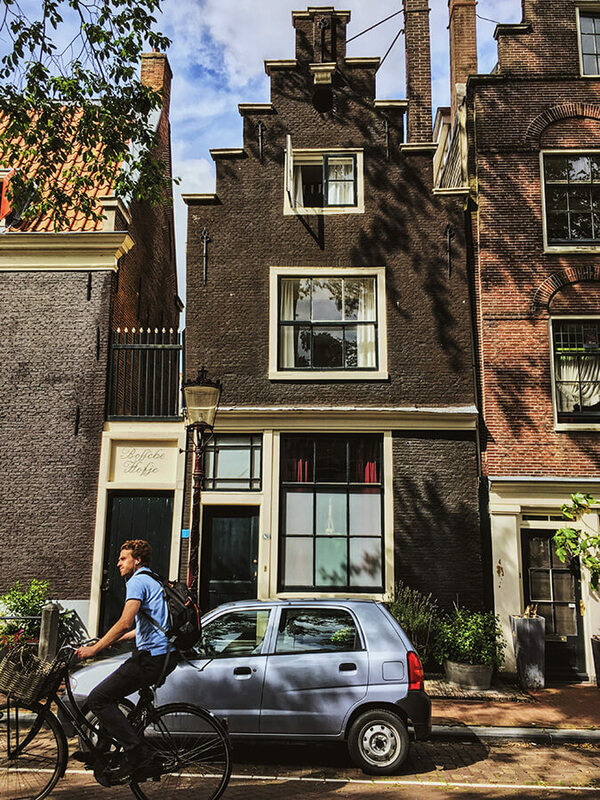 A key part of the history of the Jordaan is Willemstraat. On this street, you’ll find remnants of the Gangenproject. Beyond the doors (locked) are corridors where residents would live along these skinny alleyways in what they called “forts. ” For many centuries, majority of the residents of the area lived hidden away from the beautiful streets of the Jordaan. You can stop at 22 Willemsstraat to see a reconstruction of these forts. Amsterdam has so many lovely markets! The Lindenmarkt in the Jordaan happens each Saturday (if you’re lucky enough to be there) along Lindengracht. Although this street isn’t a canal anymore (it was filled in 1895), the wide street with tall trees is home to more than 200 stalls. I love coming here to buy flowers, bread, used books, and cheese. It’s a great place to browse for unique souvenirs that aren’t overly touristy! 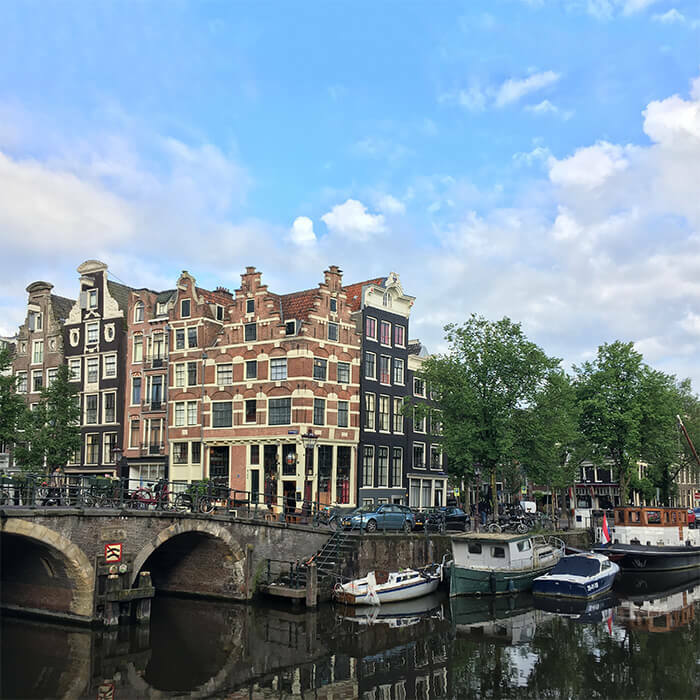 If you’re not full yet, I’ve included a stop off for a few favorite places to eat in the Jordaan. For the best apple pie in Amsterdam, head to Winkel43 for Dutch apple pie. It truly is the best. If you’re looking for a lovely brunch, lunch, or breakfast, I really like PIQNIQ. This vegan-friendly cafe has a cozy location along Lindengracht. Although it can get quite busy on the weekends, it’s worth the wait. 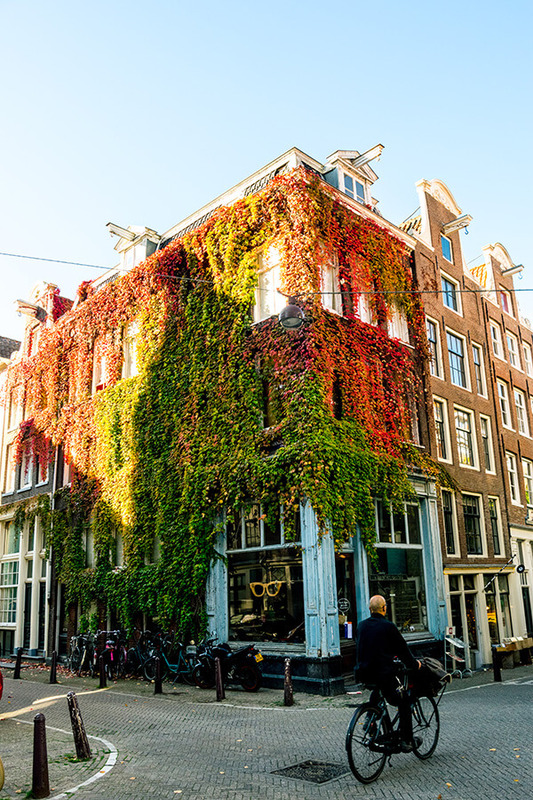 If you’re looking for something more adventurous, head to G’s Jordaan. (Be sure to make a reservation.) This boozy brunch hotspot open Thursday to Sunday is perfect for those who like a little kick with their lunch and something a bit off the wall. The prettiest house in the Jordaan!? There’s a lovely little record shop next door (Flesch Records/Books). I recommend stopping in here to browse! If you’re visiting the Jordaan on a Saturday, you’re likely to see the Noordermarkt. This farmer’s market is a great place to pick up lunch if you intend to have a picnic or simply browse. You’ll also find a number of lifestyle stalls where you can browse vintage fashion. Unlike the Westerkerk (mentioned later), the Noorderkerk was built to ensure that the commoners were Protestant Christians as well. This church built in 1620 still holds services today if you’re curious about Dutch services. You can also attend concerts here on Saturday afternoons in the summers (check for tickets ahead). I just love Lindenstraat. All along this street, you’ll find some of the prettiest houses in Amsterdam not on a canal and lots of ivy. I love to wander down here. This street (especially close to Eerste Lindendwarsstraat) is just lovely and classic Amsterdam. Luckily, most tourists manage only to find this street en route to the Lindengracht market. The largest courtyard in the Jordaan is Karthuizerhofje. This large complex was built upon a former monastery. As early as 1650, it housed widows in need of an affordable place to live. Note: please be considerate as this is private property and the inhabitants are kind enough to allow the public during daylight hours. 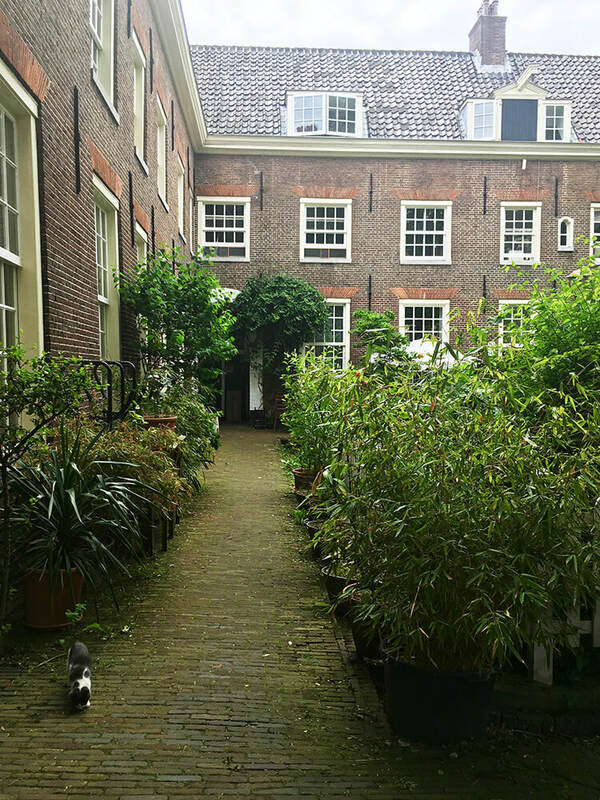 I love coming here to say hi to the numerous cats who live inside this beautiful hofje and to sit on one of the benches to catch my breath. It’s hard to find places in Amsterdam where you can truly disconnect from the rest and this is one of my favorites. For music lovers, the Pianola Museum is a great place to visit. My father-in-law visited this museum, one of the small quirky museums of Amsterdam. Within the walls of this small museum are numerous instruments, music archives, and all kinds of historic music history. 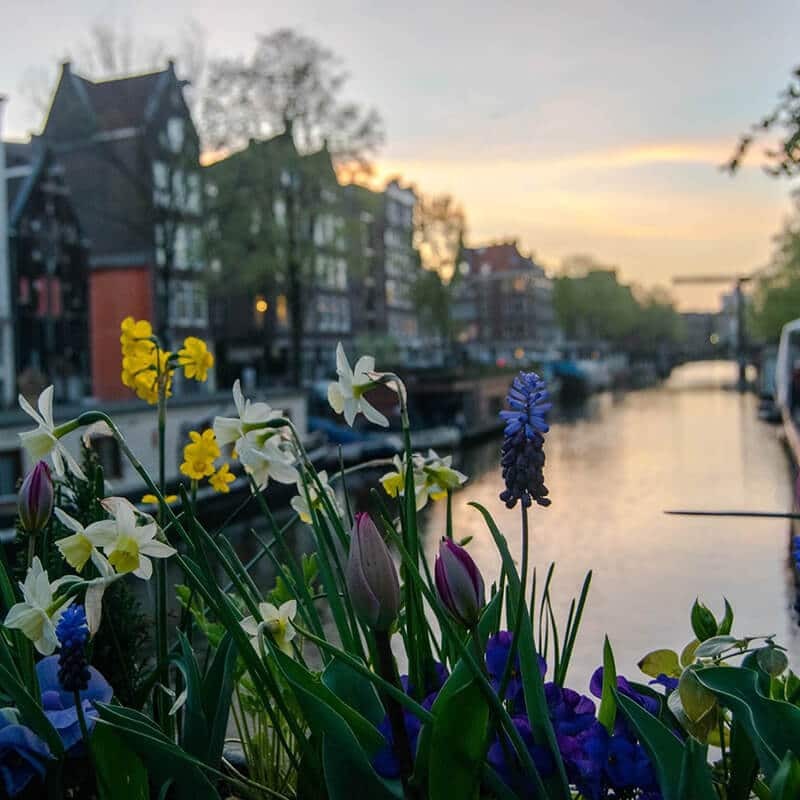 Is there anything as lovely as walking along the canals in Amsterdam? (Note: Don’t walk directly on the canals as you will be in danger of bikes and traffic; stay on the sidewalk.) 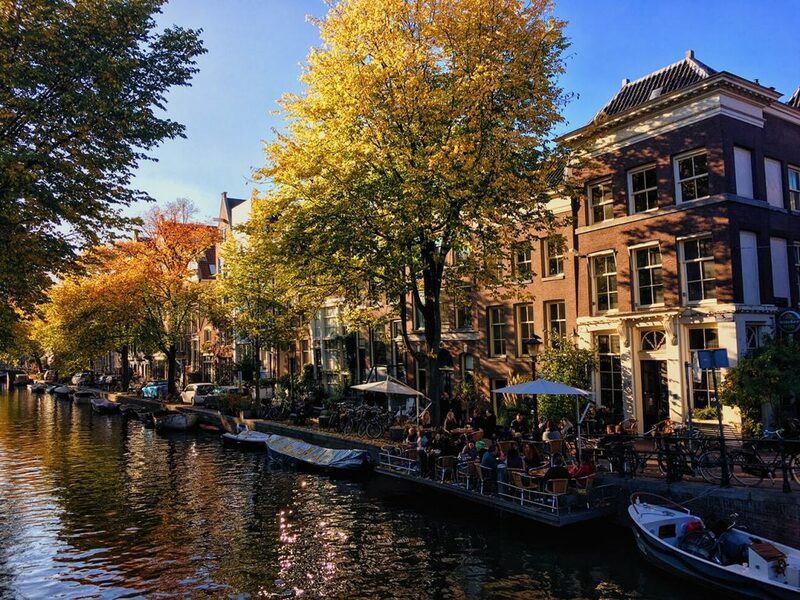 That said, although Prinsengracht is the most touristic canal, you still can enjoy little moments of relaxation as you gaze out along the water watching the various boats go by. You’ll pass one of my favorite Indonesian hole-in-the-wall places Eethuis Pondok Indah. If you’re curious about Indonesian food, the owners are incredibly friendly and cook up specialities from their home island for an affordable price. Have cash on hand as they don’t take credit cards. They’re open for dinner mostly. The Westerkerk was a church intended for the upper class aristocrafts along the larger canals. It opened in 1631 although the tower took seven more years. Today, you can climb the tower. Anne Frank could see the clock tower from the window of her attic and she wrote that the bells calmed her. On top of the tower is a crown from Emperor Maximilian. Rembrandt fans can look for his grave here! For lovers of dive bars, I recommend Cafe Chris. This is one of the oldest cafes in the Jordaan–and it’s one of the coziest places to step in for a beer. Be sure to admire the gorgeous stained glass windows. Be warned: they’re cash only. 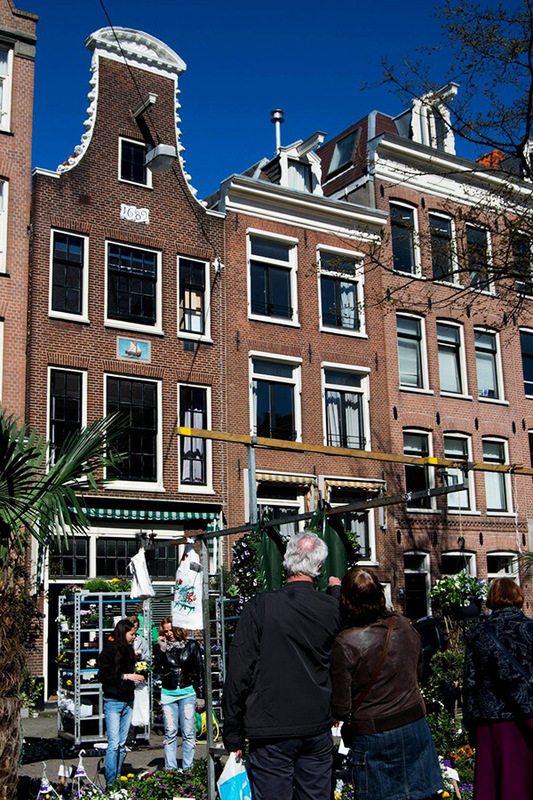 Let me know what you thought of this self-guided walking tour of the Jordaan! 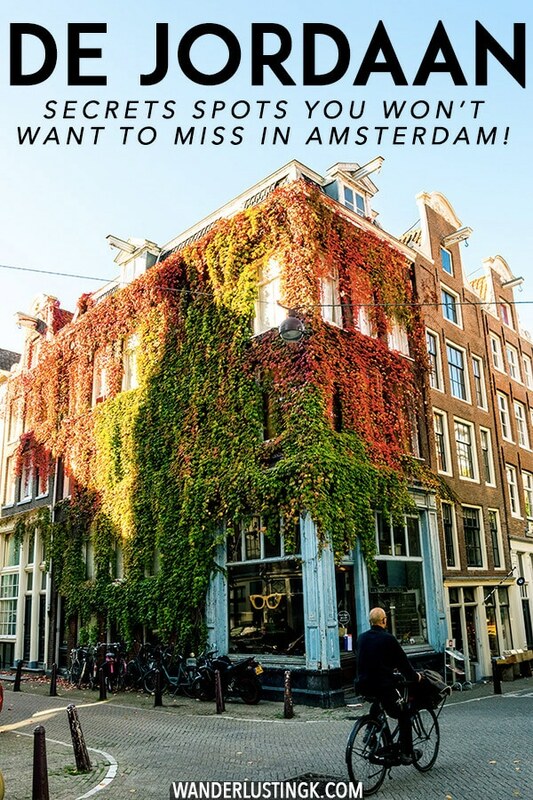 Read more tips for traveling in Amsterdam, your perfect Amsterdam itinerary, secret Amsterdam locations not to miss, and the best day trips from Amsterdam. I love Jordaan! One of my favourite neighbourhoods in Amsterdam. I was just there a few weeks ago and it puts such a smile on my face! 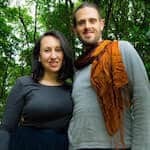 You have composed such a nice compilation of posts about Amsterdam. I feel they have truly helped me get the insiders scoop that is otherwise can be so difficult to find! 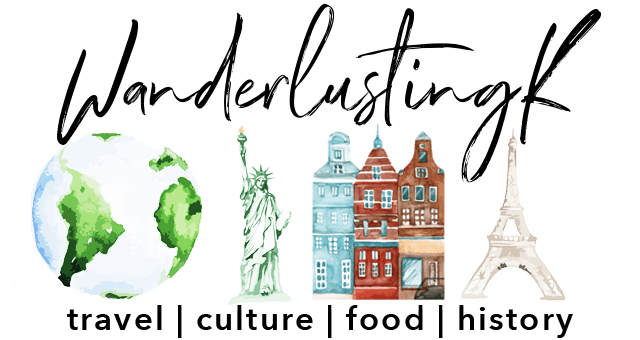 I very seldom (honestly almost never) reach out on travel blogs but I feel very compelled!! Thank you so much for your tips. From the step by step directions for getting to Amsterdam central to all the hidden cat opportunities I feel prepared for my first solo trip. I am visiting next week and am SO EXCITED!